The primary purpose of using accounting software is to make life easier by saving you time, money and provide you with better insights any time you want wherever you are. The only problem is that there are a lot of accounting software tools out there and they all say that they can do exactly what you want. So which is the best accounting software for professional service firms and small businesses and how can you find them? We wondered the same, and therefore we searched for 50 “Best of Lists,” selected and combined the 20 most valuable “Best of List” and earmarked and ranked what accounting software applications keep up appearing on most of these recently published lists. From a total of 62 Accounting Software Applications reviewed and ranked, here are the top 15 results! FreshBooks –Listed 17 out of 20 times, Freshbooks is our number one accounting software application ideal for professional service providers and other small businesses. It is an inexpensive, online-only solution that does an excellent job of standard bookkeeping, invoicing and is perfect for smaller firms and independent contractors. FreshBooks started as a basic online invoicing service, and it quickly added features like financial reports, expense- and time-tracking, and has an impressive family of integrated add-ons that extend its usefulness. Over the years, FreshBooks has incorporated countless smaller changes that have made it more capable, while retaining its simplicity and ease of use. QuickBooks – Listed 18 out of 20 times, QuickBooks is regarded as one of the best accounting software for professional service firms and other small businesses. It is popular with users for its wealth of features and user-friendly interface. It is an intuitive, feature-rich accounting system that can support the needs of most small and medium-size businesses. All versions of this program allow tracking of income and expenses, invoicing, and online linking to financial institutions. The Essentials versions provide access for up to 3 users, while the Plus version adds inventory tracking, purchase order handling, and access for up to 5 users. Xero – Listed 18 out of 20 times, Xero is a cloud-based accounting tool, which allows invoicing, purchase orders, bank reconciliation, inventory monitoring and more. It’s accounting package targets small to medium-sized businesses (SMBs). The wealth of features and attractive and intuitive user interface have made it very popular with most users. Besides browser support, Xero has Android and iPhone/iPad apps for mobile devices. Sage 50 – Listed 6 out of 20 times, previously also known as Simply Accounting. It is a tried and true comprehensive small business accounting solution. Like QuickBooks, Sage uses monthly payment-based cloud versions, which are in fact excellent value for money as payroll is included. Sage 50c is its small business desktop accounting solution, incorporating a comprehensive set of features and customization options with underlying cloud functionality. Wave Accounting – Listed 13 out of 20 times, is web-based accounting software for small businesses. Amongst others, its pricing is somewhat different than most competitors, as it offers a free version of its software while charging monthly fees for customer support, offering two service tiers to choose from. It has an appealing look and a set of features that will please many sole proprietors, contractors, and small businesses. Sage One – Listed 8 out of 20 times, is basic, inexpensive, cloud-based accounting package. Sage One is designed for entrepreneurs and small businesses that need basic income and expense. It does not include features such as time billing, payroll, and reporting is minimal. If you are just starting a freelance business or are a small business owner without employees, the standard online invoicing/billing package like Sage One will likely be your perfect match. Zoho Books – Listed 12 out of 20 times, is an excellent, and very flexible accounting service that matches the top players in the market. The tool is a subscription-based online accounting application that is used a lot by small businesses. Expense tracking, invoicing, estimating, time tracking, and bill payment features make it ideal for freelancers. Unfortunately, at present it does not include payroll nor does it integrate with third-party payroll apps or services. AccountEdge Pro – Listed 6 out of 20 times, is a simple desktop-based accounting software that runs payrolls and manages purchases and sales. IIt’s double-entry feature allows accountants to analyze their files and extract operable info for insightful custom reports anytime. Its features include great inventory reports, automated invoicing, and direct deposits. What this financial software for small-business owners boasts is mobility. Also, this software provides all relevant banking functions: make and receive payments, create accounts, and make electronic payments. FreeAgent – Listed 7 out of 20 times, this software is simple to use for all types of small businesses enabling them to handle their own finances. It offers double-entry bookkeeping along with basic expense tracking and invoicing software. The best thing about FreeAgent is that it allows unlimited users, invoices, expenses and clients all for one monthly price. It also has a cool project management feature for its users to keep track of hours spent on projects. This is a perfect accounting software tool for small businesses, consultants, and freelancers. Kashoo Online Accounting – Listed 8 out of 20 times, this accounting software aims to be simple. It provides basic accounting features and wants to make it simple for business owners to handle accounting themselves. Features offered are: bank imports, reporting, invoices and expense reporting, cash flow, payroll integrations, tax reporting and data exports. It is cloud-based, and it offers a simple solution and also has some handy mobile apps. Harvest – Listed 3 out of 20 times, features time tracking with online invoicing as a secondary offering. This software is recommended for small business owners or self-employed, who don’t want an especially complicated platform at first. Harvest is a streamlined platform that allows its users to easily and quickly create invoices. Also, Harvest supports uploading data to Excel and Quickbooks, which is a nice feature for everyone who wants to take care of monthly invoicing. 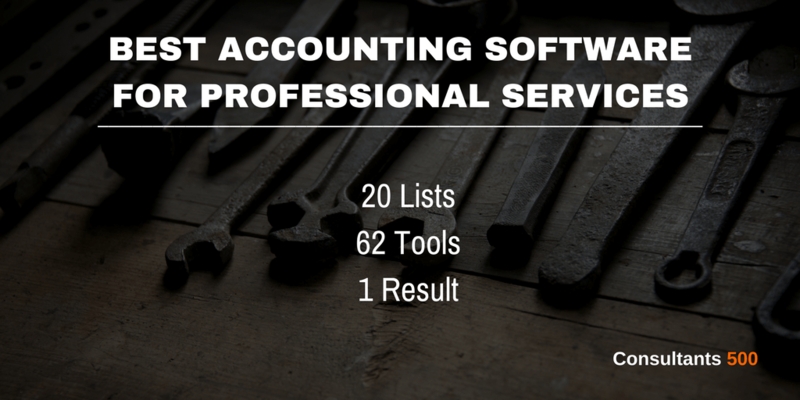 Less Accounting – Listed 4 out of 20 times, on our list of best accounting software for professional service firms. Less Accounting can be an alternative to QuickBooks that offers all the necessary tools that a small business needs. It includes income and expense tracking, invoices and proposals, various reports, mileage tracking, and it can connect to multiple banks and download transactions. Users can import contacts from various address books to set up a customer contact and customer relationship management system. NetSuite – Listed 4 out of 15 times. This is primarily a customer relationship management (CRM) solution. However, the tool can be used for sales force and marketing automation, as well as order management and customer support. Via many features offered, it makes financial management simple. Standard features include preconfigured dashboards that can be customized by users for their specific needs. NetSuite also has robust automation and scalability features, and users can customize their view of key performance indicators and generate reports that are unique to their role in the company. One Up – Listed 4 out of 20 times, this is online accounting software for small businesses that allows its users to create and send invoices, manage inventory, track bills, and more. There are different pricing tiers available, depending on the number of users; all features are included in every level, though one-on-one support isn’t included in the lowest package. OneUp stresses automation in its approach to handling finances, with seamless integration with the bank account. Intacct – Listed 4 out of 20 times, Intacct is our final tool of best accounting software for professional service firms and small businesses. It is Web-based financial accounting software that offers a broad set of functions for small to mid-sized businesses. Founded in 1999 in San Jose, California, Intacct now serves over 30,000 users. The system is meant for a wide variety of industries as a horizontal accounting system, and it is the right choice for small businesses that are looking for a more advanced accounting platform. Therefore, to use the software effectively, you need to be well versed in accounting and related processes. As you can see, FreshBooks, QuickBooks, and Xero are by far the most popular tools in our list of best accounting software for professional service firms. Each of them was mentioned more than 17 times (out of 20) as being one of the favorite accounting software applications, leaving the rest far behind. As stated earlier, the whole point of using accounting software is to make life easier by saving you time and money. Therefore, if it doesn’t, and you can accomplish more or less the same without these tools, you should question whether it’s worth all the work of setting up the systems. The ability to create professional looking invoices. By connecting your bank account, your business expenses are tracked automatically. Some tools provide time tracking, so you know how much time certain tasks take. Incorporate online payment processing and accept credit card payments. Instantly see your profitability and create standard reports for financial statements, for tax purposes, and much more. Get all the features and insights on your mobile. Overall, the whole process of bookkeeping should become faster. Some things should be automated, such as VAT returns or bank reconciliations. The preparation of your quarterly and year-end reports and tax returns should be more straightforward. Lower your fees for your accountants, tax advisors, and bookkeeping. Freed up time that can be used for other more relevant business activities. Make better business decisions as a result of better and more timely information. We made a list of 50 posts that we recently published about “Best Accounting Blogs” to follow. We combined the 20 lists about “Best Accounting Blogs” and earmarked all individual blogs that were on those lists. More weight is assigned to blogs who are clearly listed more times than other blogs. All lists were summed up, and the blog with the lowest number was ranked 1, 2, 3, etc. This resulted in the final list of best accounting software for professional service firms” which tools are used by many small business owners and/or professional service providers.